London transport bosses will start a review of Tube station ticket office closures within the first three months of Sadiq Khan's mayoralty. Transport for London (TfL) will also begin consultations into air quality and making a pedestrian-only zone in Oxford Street in central London. Other 100-day milestones - agreed by TfL - are the launch of a safer trucks programme and the completion of 12 junction upgrades to improve safety for cyclists. It is also claimed the Night Tube will be ready to run on two lines "from this summer" and TfL will also recommend the best way to structure a fares freeze beginning in January 2017. The aims are set out in the Delivering Your Manifesto document drawn up by TfL commissioner Mike Brown and were presented to Mr Khan after their meeting at City Hall on Monday. 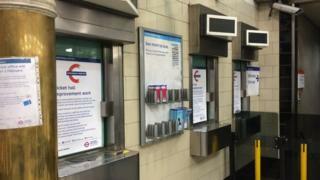 The ticket office closures had promoted strikes in the past but TfL said it would save £50m annually. Appointment of a new "walking champion"
The document also reveals the mayor wants to set up a new advisory body - Homes for London - within the first three months, in order to help the capital reach a target of 50,000 new homes per year. The measures come on top of the one-hour bus hopper ticket fare announced by the mayor on Tuesday with a planned roll-out for September. The air quality consultation will be 'the most ambitious in London's history', the document says. There is also a pledge to set "a new course for cycling in London which is inclusive and open to all," with an emphasis on cycle training. The document continues: "We will deliver a fundamental change in how we are structured and how we operate. "We are taking action to merge our engineering functions, be more commercially focused and reduce expensive contractors."